It was two years ago that I did this now beloved painting. It was the first piece I completed when I decided I was going to get " serious" about my painting. 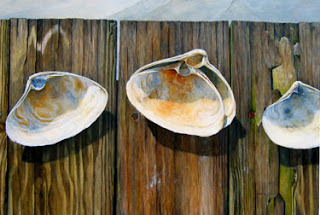 It just won the Frederick Nunn Silver Award at the Cape May County Art League's annual tri-state juried art show. I figure this may be the last award for awhile on this piece. It's taken three other ribbons in the last two years. Most juried shows have a two year time limit on submitted works. Unlike many artists these days I am careful to date my work when I sign it. I was also at the opening reception for the Ocean City Art Center's "Vanishing Seashore Cottage" Show last night. They have such a wonderful selection of paintings by local artists, if you are in the area I highly recommend stopping in to see it. A big congratulations to you. That is a great painting as it has proved. Good for you!! Thanks for the kind words Jo. I wish I could say winning or not winning ribbons doesn't matter to me, but I really get a charge when the artistic community gives me recognition. Especially with a check!! heheheh.